Do Snapchat's Spectacles Make The Cut? Do Snapchat’s Spectacles Make The Cut? Snap Inc’s Spectacles are one of the oddest pieces of hardware I’ve ever used. Typically, when a new technology is introduced it lives or dies based on how well it is executed. Think the fingerprint sensor on a smartphone: whether it was fast enough and accurate enough to be trusted was key. But the Spectacles are different. There’s almost no question that they achieve everything their designers set out to do, and they achieve it well. But that design is so idiosyncratic, so confected, and so strange that it’s hard to tell whether the product is actually … well, any good. 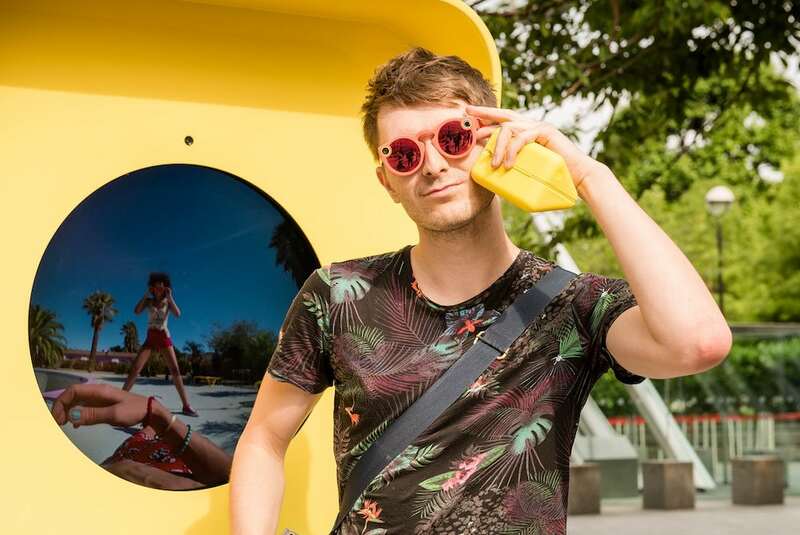 The Spectacles are a pair of £129.99 sunglasses, with a camera tucked away on the top right hand side of the frame. That camera shoots “HD” video (the resolution is 1088 pixels wide, but it’s also circular) in 10-second clips when you push the button on the left hand side. There is no stills camera. The battery will last for about 100 clips and the hard case the Spectacles come with has its own in-built battery which can fully charge them four times over. That means you can shoot a little over an hour of footage without needing a power supply. The footage is extremely wide-angle, with a 115 degree field of view. But that’s not quite what it sounds like, because the majority of your viewers are never going to see the full video. Instead, the specs export the clips to Snapchat in a unique full-screen stabilised format. Whichever way you hold your phone, the video takes up the whole screen: portrait, landscape, or diagonally. That Snapchat integration is both a blessing and a curse. It a blessing because it allows an integration of hardware and software rarely seen in tech companies other than Apple: having a unique video format for a specific app is a bold move, but one that pays off. The curse is that not everyone uses Snapchat. It’s possible to export clips to your phone’s camera roll, but they immediately lose some of their magic. Uncropped, the circular videos are less wondrous than they initially seemed and you’ll quickly find yourself wishing they were just normal squares. That way they’d look more conventional when shared on Twitter, Facebook or Instagram, though to be fair, that’s not the point. Snap didn’t make a pair of glasses for people to shoot great Instagram updates on. A similar problem exists with the filming functionality. The clips feel surprisingly short when you’re doing anything you’d really want to be filming and sharing. I tried climbing with the Spectacles on and struggled to find a route I could complete in the span of one clip. The same is true if you’re skateboarding, running, or even just playing with your pet. You don’t want to have to press the button every 10 seconds, you want to capture everything and edit it down to the best stuff after. But again, it’s clear that the constraint is deliberate. Unlike Google Glass before them, the Spectacles are unlikely to get you in trouble for clandestine filming. They go to great lengths to announce when they’re on – an extremely obvious spiralling light counts down the seconds – and they can’t be set up to record permanently. They are for shooting … well, Snaps. If you are a Snapchat user, you likely already know the joy of short video clips, and how to arrange your social media communications around them. The pair I try are “coral” – bright pink with pink tortoiseshell arms and yellow rims around the lens. Some people may be able to pull it off; I, however, was told unprompted that there was “something of the Jim’ll Fix It” about my look. I am 27 though, and so older than Snapchat’s core target market. And that’s the nub of it. If you’re young and using Snapchat incessantly – if you know what a Snap Streak is, and would rather lop off a finger than lose yours – then the Spectacles are a great, albeit pricey, addition. But if that isn’t your world, these probably aren’t for you.